Gas prices have now sustained a daily increase in price over a month of days and there appears to be no end in sight. Pundits in many different disciplines have predicted gas prices to reach or exceed $5.00 a gallon in the summer of 2011. We’re unsure of where gas prices will end up this summer, but we are sure there are plenty of high MPG choices for our readership looking to acquire a new car now. We recently took a look at 15 high MPG new cars available for sale in the United States and now we offer the top twelve performing gasoline fueled cars for sale in 2011 in terms of overall EPA estimated MPG. For those who are looking for a used car, there is no reason to sacrifice fuel economy just because you’re buying a used car, something that four out of five car buyers are doing. The EPA recently began offering downloadable window stickers for used car dealers to print and use. For those who are looking exclusively at new cars, we have this resource. While we’ll admit the EPA estimates that were offered for the Chevrolet Volt and Nissan Leaf are impressive, we’re not including these two primarily-electric vehicles in this list. We’ve also excluded diesel models. Hybrids, however, do make the cut, and there are a few that made the top twelve. Where a single manufacturer produces multiple models from the same basic platform, we’ve listed each of them in the same slot in terms of numerical order rather than resorting to ties that would have reduced the overall list. Additionally, the rankings are based on EPA city estimated MPG, as we believe most people will be doing more city driving. With that, we present the top 12 EPA estimated MPG cars for 2011. We expanded from our normal top ten list just because of this car. It just seems wrong to leave the superior experience of the six-speed gearbox in this car behind while the automatic (CVT) equipped version would remain. It may not offer a pure sports car experience, but it isn’t a bad experience, just a bit underpowered with an underperforming suspension. This version of the 2011 Honda CR-Z just 31 MPG in the city, 37 MPG on the highway, for a combined EPA estimate of 34 MPG. The Honda CR-Z with the six-speed manual transmission has a MSRP of $19,345. The Lexus RX 450 offers a mid-sized SUV luxury experience in high style. Not to mention it does so with an EPA estimated 32 MPG in city driving, 28 MPG on the highway, for a combined 30 MPG estimate. As a luxury vehicle, MSRP starts at $43,935 for the Lexus RX 450. The Nissan Altima Hybrid is a competent, if awfully vanilla sedan that’s a fine performer despite its snoozer looks. The Hybrid from Nissan gets an EPA estimated 33 MPG in the city, 33 MPG on the highway for a combined EPA estimate of 33 MPG. MSRP on the Nissan Altima Hybrid starts at $26,800. We don’t mean to complain, but shouldn’t a car as small as the Smart Fourtwo get better milage than this? 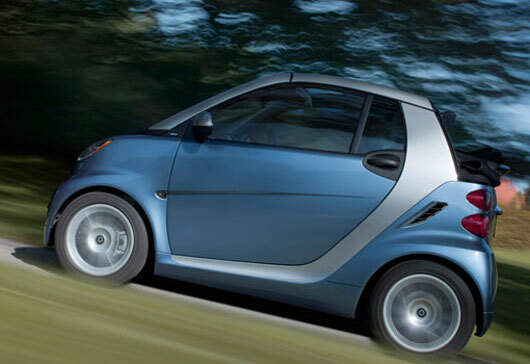 Both version of the 2011 Smart Fourtwo get 33 MPG in the city, 40 MPG on the highway, and a combined EPA estimate of 36 MPG. Pricing on the Smart Fourtwo starts at $12,490 for the coupe and $17,690 for the Cabriolet. Ford used to have triplets, then wonder-twins in the small hybrid SUV class with the shuttering of the Mercury brand. The the two became one when Mazda quit carrying the hybrid version of the Tribute, which we’ve pictured above, since we’ve always preferred the styling of the Mazda version. The lone standing Ford Escape has an EPA estimated city milage of 34 MPG, highway estimate of 31 MPG, for a combined EPA estimate of 32 MPG. Starting MSRP on Ford’s Escape is $30,045. Lexus’ second entry onto this list fits into the middle pricing position, with prices declining the higher the MPG get on their vehicles. The HS Hybrid gets an EPA estimated 35 MPG in the city, 34 MPG on the highway, for a combined estimate of 35 MPG. The Lexus HS Hybrid has a starting MSRP of $34,650. The CVT equipped Honda CR-Z bests the EPA milage estimates of manual transmission version of the car. While neither version of the CR-Z delivers on the fun and sporty promise of former Honda glories like the CRX-Si or Civic Si, we do prefer the six speed manual version. EPA city estimated MPG on the CVT CR-Z is 35, while highway MPG is 39 for a combined EPA estimate of 37 MPG. Starting MSRP on the 2011 Honda CR-Z equipped with the CVT is $19,995. Hyundai’s restyled Sonata is offered in three different versions: standard, turbocharged and hybrid, and all three of them offer absolutely gorgeous sheet-metal. The hybrid version features phenomenal fuel economy. EPA estimated city for the Sonata is 35 MPG, 40 MPG on the highway, for an EPA combined estimate of 37 MPG. The 2011 Hyundai Sonata Hybrid has a starting MSRP of $25,795. We find it shocking that Honda’s utilitarian Civic Hybrid matches up exactly with what is Honda’s answer to the Toyota Prius, the Insight. Really, Honda – why is Toyota’s fuel economy so much better with the Prius? Not that the Insight or Civic Hybrid are exactly slackers, with EPA estimates of 40 MPG in city driving, 43 MPG on the highway, for a combined EPA estimate of 41 MPG. Truth be told, they have the exact same power-trains, but couldn’t Honda refine the drag coefficient of the Insight just a tad more? The Honda Civic Hybrid has a starting MSRP of $23,950 while the Honda Insight has a starting MSRP of $18,200, which makes it the lowest priced hybrid in the United States. Ford’s twin sedans, now that the triplet Mercury Milan Hybrid has been shuttered along with the entire Mercury brand, show that American automakers can fully compete in the MPG wars. They tie at number three with an EPA estimated 41 MPG in the city, 36 MPG on the highway, for a combined EPA estimate of 39 MPG. The Ford Fusion has a starting MSRP of $28,340 while the Lincoln MKZ has a significantly higher starting MSRP of $34,605 with a much higher level of equipment. The Lexus CT200 Hybrid still hasn’t been added to the EPA’s top 10 list of top performing MPG cars, but it certainly makes our top 12. It gets 43 MPG in city driving and 40 MPG on the highway with a combined EPA estimate of 42 MPG. The Lexus CT200h has a starting MSRP of $29,120. The world’s best selling hybrid, now in its third generation, is still the top performer in the EPA city estimated MPG. Toyota’s smash hybrid gets 51 MPG in the city, 48 in highway driving, for a combined rating of 50 MPG. MSRP on the Toyota Prius starts at $23,050.